Mehreen Murtaza, Figure 8. 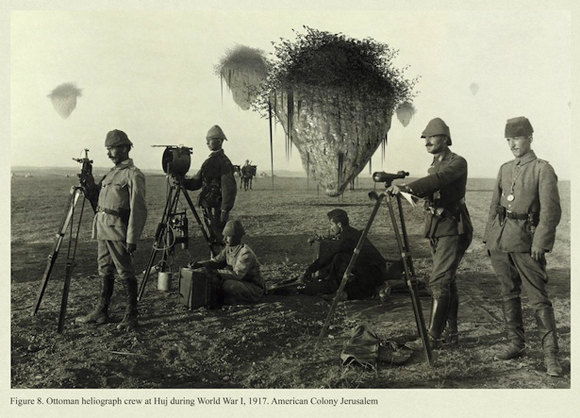 Ottoman heliograph crew at Huj during World War 1, 1917, 2012. Inkjet print on Hahnemühle photo rag, 21.94 x 30.48 cm. Critical and creative views on contemporary media culture. The exhibition will show the works of and collaborations between a variety of young, up-and-coming international artists as well as less traditional, commercial and amateur ‘makers.’ Relevant issues surrounding originality, hybrid authorship and modified global perspectives will be examined whilst the distinctions between artist/curator/audience will be deliberately blurred. Oscar Guardiola-Rivera (Senior Lecturer of Law, Birkbeck London and author of What if Latin America Ruled the World?, 2010), Sohail Inayatullah (Futurist, Professor at the Graduate Institute of Futures Studies, Tamkung University, Taiwan), Omar Kholeif (Curator at FACT, Liverpool, and Senior Editor at Ibraaz Publishing, London), Jaap Kooijman (author of Fabricating the Absolute Fake: America in Contemporary Pop Culture, 2008, and senior lecturer of Media and Culture studies at Amsterdam, Netherlands), Vinay Lal (cultural critic and professor of history at Delhi University and the UCLA), Nat Muller (independent new media curator, Rotterdam, Netherlands), Louise Muller (independent researcher), Ruangrupa (artists initiative, Jakarta), William Uricchio (Director of the MIT Comparative Media Studies, Massachusetts), Zafka Zhang (co-founder of China Youthology, Beijing, China). The Impakt Festival’s Festival Fellow this year is Parmesh Shahani, who heads the Godrej India Culture Lab—a space that aims to interrogate the textured nature of Indian modernity by cross-pollinating the best minds working on India from across the academic, creative and corporate worlds. The 23rd edition of the Impakt Festival takes place October 24–28, 2012 across the venues of CBKU Gallery, Theater Kikker, Filmtheater ‘t Hoogt and the Academiegalerie in Utrecht, The Netherlands. For all inquiries please contact Femke Gerritsma: femke [​at​] impakt.nl or T +31 (0) 302944493.